I’ve always opted for wearing an XC style shoe for my riding. 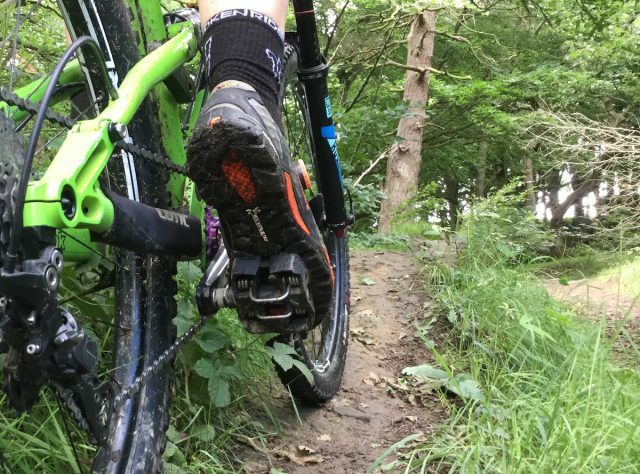 I’m not a fan of bulky trail shoes and, due to a substantially inferior power-to-weight ratio than my riding mates, I want to maximise the chance of any power I generate from my legs making it through to the pedals. 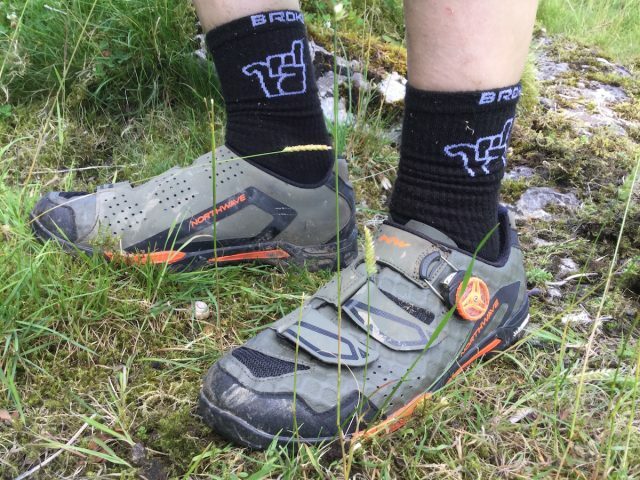 But wearing XC shoes for everyday trail riding comes at a cost: the uppers get shredded on rocks, they offer little protection from trail debris and stiff soles make those hike-a-bike moments (and tea carrying in cafes) just that little more challenging. As I started to ride more and more technical terrain my shoes really started to suffer so I invested in a pair of Enduro shoes which, rather than making me look gnar, make me look like I’m riding in a pair of Mr Men brogues. 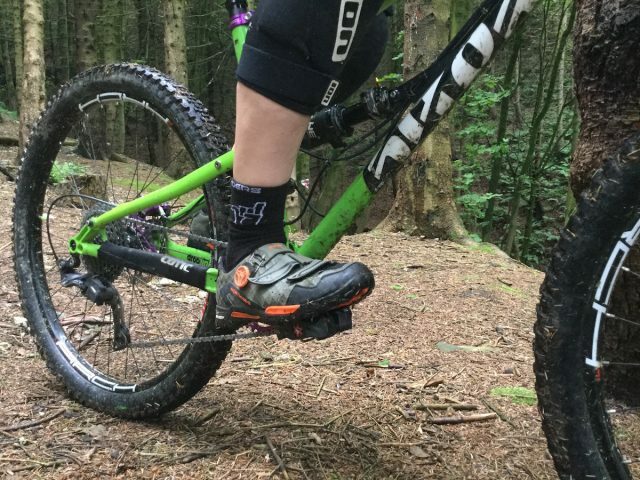 There are three models in the Outlook shoe range from Northwave. This is the top-end ‘Plus’ model. Northwave’s Outcross clipless shoe aims to bridge the gap between bigger Enduro style shoes and more rigid but less robust XC shoes. Designed to take the best properties of both, the Outcross is lighter and stiffer than an Enduro shoe but more flexible, robust and grippier than XC shoe. Would these be the perfect Goldilocks trail shoes for me? The Outlook Plus is a shoe that sits between a superlight XC race shoe, and a heavy-duty enduro boot. The shoe’s upper is a mesh overlaid with an abrasion-resistant outer that has reinforcements on the toes and other vulnerable areas. After several months of use and some big riding including long hike-a-bikes they continue to look in really good condition. So much so, when taking the photos for this review, I was concerned that they didn’t look like they’d really been worn and were rather untested. 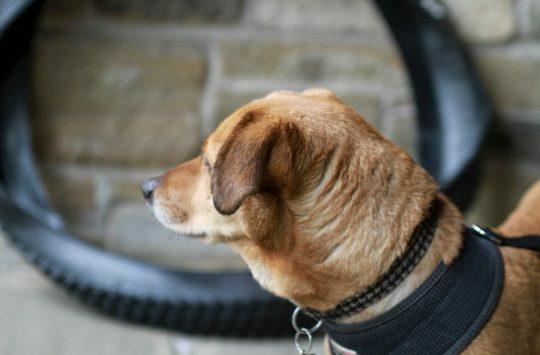 The sole is designed to be stiff in the midsole to optimise transfer of power to the pedal whilst having sufficient flexibility further back for walking. I’ve been surprised at how stiff the shoe feels on pedalling, it seems stiffer than my bog-standard XC shoes. The shoe is also reasonably thin through the upper and insole so there isn’t loads of soft furnishing to absorb the power. 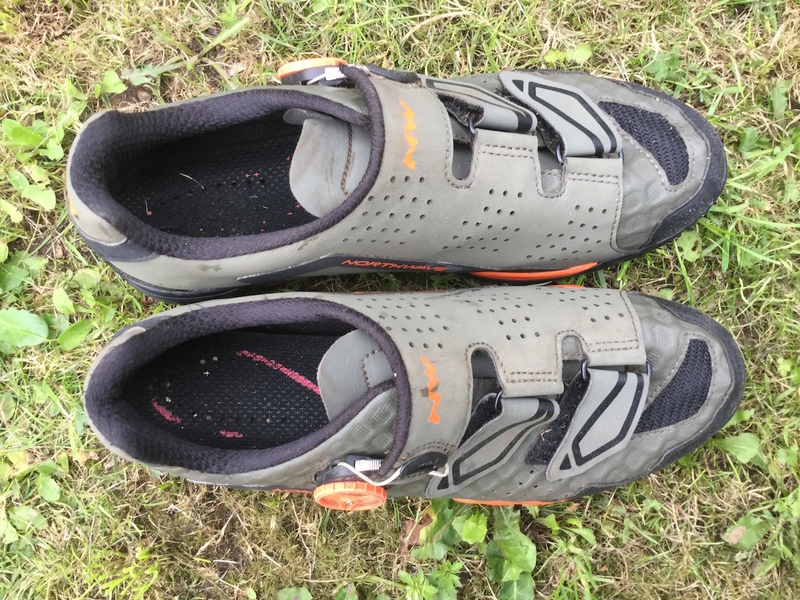 The stiffness is such that I can quite happily wear these for big pedally rides and even went as far as using them as my spare shoes in my last 24hr solo. 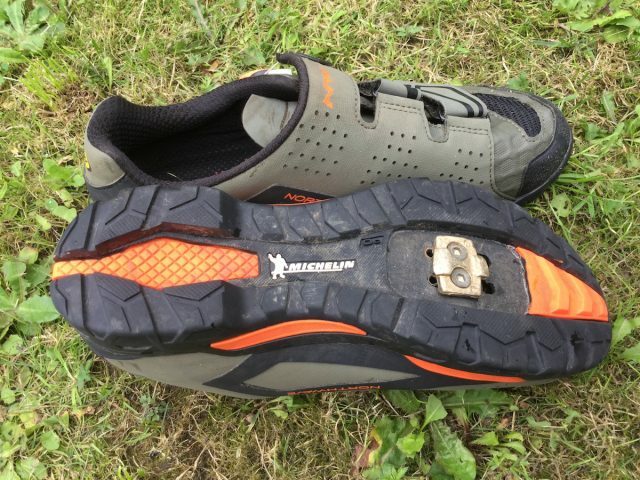 Michelin rubber outsole is very grippy and ideal for riding on technical and natural trails where you might need to shoulder your bike for some sections. The walking flexibility of the sole is good too. The Outlook feels pretty normal when you walk and doesn’t give you that clippity-clop, skiddy gait that many bike shoes do. The sole is made from Michelin’s rubber and is touted to be “28% more abrasion resistant than TPU”. This isn’t a statement that I can scientifically verify but, like the uppers, the soles show little sign of wear at this point. As you’d expect, the tread is aggressive and I’ve not had a single moment where I’ve worried my foot won’t grip when trudging up trails and clambering over rocks, either from a grip or a flexibility point of view. 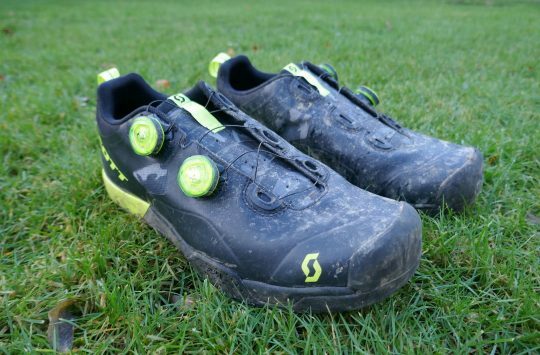 They’re at their grippiest on rocks and man-made trails but also perform pretty well in mud although they’re not so good in claylike mud where it’s been hard to get any purchase. There isn’t an option to put studs in the toes so there isn’t the any scope to change the grip for such conditions. SL2 dial works like a BOA ratchet system. There are three versions of the Outcross: lace up (the Outcross Knit; £69.99), three strap (the Outcross; £79.99) and the Outcross Plus (as tested) which has a Speed Dial system (similar to Boa’s) and two Velcro straps (£104.99). They are also available in men’s and women’s fit. I wish I’d known this at the outset as the men’s version is much too wide for my stupidly narrow feet. However, despite its excessive girth and having to tighten the straps so far it looks it’s been trussed up with string, I’ve not had any issue with my foot moving around either on pedalling or walking. 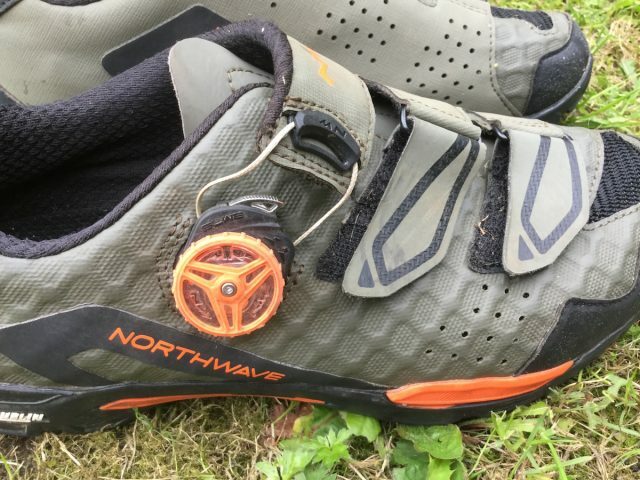 The heel cup doesn’t look anything fancy but with Northwave’s speed dial and two Velcro straps holds the shoe perfectly in place. Whilst I’m a fan of the speed dial the price difference between this version and the other models is fairly substantial (£25 or £35 depending on model) and may not be worth paying. Weight-wise this pair weighed in at 815g without cleats (size 41) which is about 100 grams more than my XC shoes but 100g less than my Enduro ones. The Outlook Plus shoes are surprisingly stiff and deliver excellent power transfer. The only and unfortunately fairly large flaw for British riders is the leakiness of these shoes. The small area of mesh on the toe isn’t waterproofed and there is no cover on the inside of soul where the cleat sits meaning if you put your foot in a puddle the water comes straight in. If you’re happy to rely on waterproof socks then you’ll be ok, otherwise you’ll probably want to limit wear to drier days. If only Northwave didn’t design and test all their kit in Italy….. The Outlook has become my go-to shoe repelling the rough and tumble of everyday trail riding. Pity they don’t repel water too, but you can’t have it all in one shoe. As it stands though, the Outlook Plus is tougher and grippier than a pair of XC slippers, and is lighter and stiffer than a full-blown Enduro shoe, making these a terrific all-day trail shoe for clip pedal users. 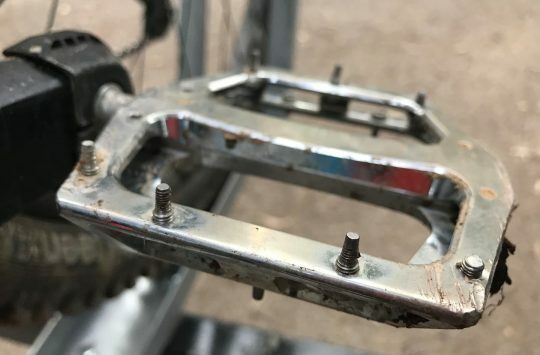 What The Heck Is The Trek 'Thru Shaft'?